At least (!) there is more publicity – possibly will create more of a push for SOMEONE to DO something about this before more horses are killed. Seems to me people in the community might have a pretty good idea about who it is thats responsible. This kind of hatred towards wild horses would be pretty obvious to see. Evidence just seems to disappear up here,” says Sanchez, referring to the stallions being buried after numerous requests for someone to investigate the bodies. 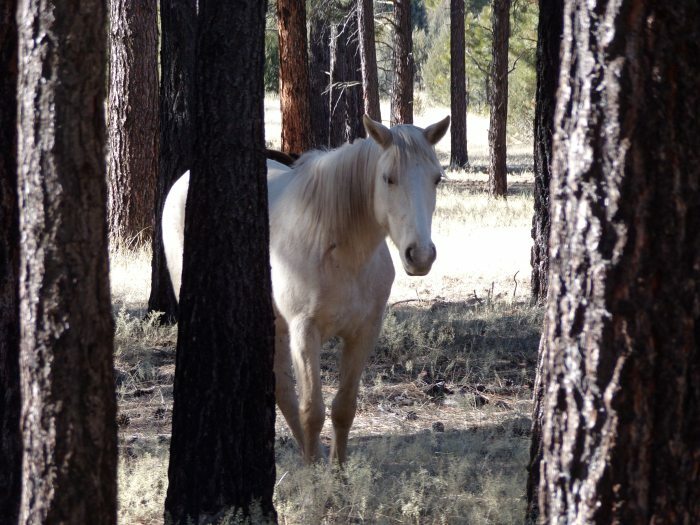 Wild horses are also legally considered wildlife, so you should also involve wildlife officials if the USFS is failing in their legitimate investigation responsibilities. Consider what happens if someone takes too many fish, or kills a few extra deer or elk, in or out of season! Nothing less can be sufficient here. I’ve posted comments on some of these articles. My comments just disappear into the spam box..I guess. It is unimaginable that they would say the same for a poached deer or elk in the national forest. I worked for the USFS and was proud to do so, but that seems to have been in the dark ages when public service actually meant what it says. I am wondering if Robin Crawford (or anyone concerned) actually followed through on contacting the FBI ??? Public safety is really an issue with a heinous crime of this magnitude! In light of the recent Salt River Mgmnt. Group shootings, this has to be a related chain of events that has to addressed asap by the highest possible authority. It appears that the local law enforcement and USFS is not taking this seriously enough. What next then? More death?